People almost never respond favorably to change that threatens their revenue. That’s why it doesn’t surprise me that so many people in radiology have few kind words for what is most often called value-based radiology. But responding intelligently and effectively isn’t necessarily the same as responding favorably. Imaging is being asked to plan for this as-yet-undefined reimbursement environment, while the information that’s available suggests imaging should expect a continuation of the past five years’ reimbursement cuts. It’s difficult to get excited about that. In the big picture, efforts to move away from fee-for-service (FFS) reimbursement are driven by the widely held sense that FFS pushes up the cost of health care by incenting more procedures. For decades, rising costs were of modest concern as long as revenue rose to cover those costs and maintain profitability. As it became clear that this model isn’t sustainable and the cost can’t just be kicked down the road, as it has been for decades, payers and policymakers have begun seeking—though not really finding—other approaches. Yet FFS has the virtue of rewarding physicians for working hard and efficiently. Other reimbursement models can struggle in that regard. Further, radiologists really don’t drive volume. Individual patient demand, defensive medicine, and an aging population are bigger drivers. But, in the big picture, blunting health care’s cost curve will take precedence over such factors, and there will be movement toward some different reimbursement systems in the United States. 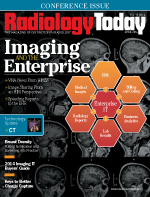 Imaging’s challenge in migrating from the current FFS environment toward some value-based reimbursement system is that, as of now, there’s no definition of the value radiology is being asked to prove. That makes the job more difficult, but that job is coming nonetheless. The good news is that there’s no way medical imaging will go away. Radiology will no longer be the revenue-driving favorite son of health care organizations, but clinicians rely heavily on imaging exams to make diagnostic decisions and that won’t change. Further, good imaging organizations know a great deal about what excellent imaging entails, even though articulating that knowledge and quantifying how to provide that excellence remains a challenge to many. There will be more alignment and integration in health care. There will be mergers, acquisitions, alliances—and exclusions. How radiology will secure its place at the health care table is changing—and it’s unclear how, which is aggravating—but there’s still an important place at the table for it.